1) ALL proceeds go to a German Shepherd rescue. That’s right, the author is getting no money for this. 2) It’s a story about a dog who gets adopted out of a kill shelter and gets a second chance at life. I’m a huge animal lover and when you not only have a meaningful story but you pair it with a very generous author and illustrator, you have a winner. There’s just something about knowing your purchase goes to a great cause. The author wrote a beautiful story about a dog who gets a second chance at life. Neo’s in a kill shelter and when his time is up, he’s saved by his guardian German Shepherd angel, Talia. She keeps the workers away from Neo until the day that his new owner arrives to take him home. The illustrator did a great job portraying the story. The ending is extremely sweet and I will admit that I got teary eyed when reading it… and I’ve already read it twice so far. It’s such a heartwarming story that any animal lover will fall in love with Neo’s New Home. There were actually two things that I loved about this book. I love the fact that all the proceeds will go to help other dogs in need. Usually when you see that proceeds from an item are being donated, it’s usually a small portion but that is not the case with this book. 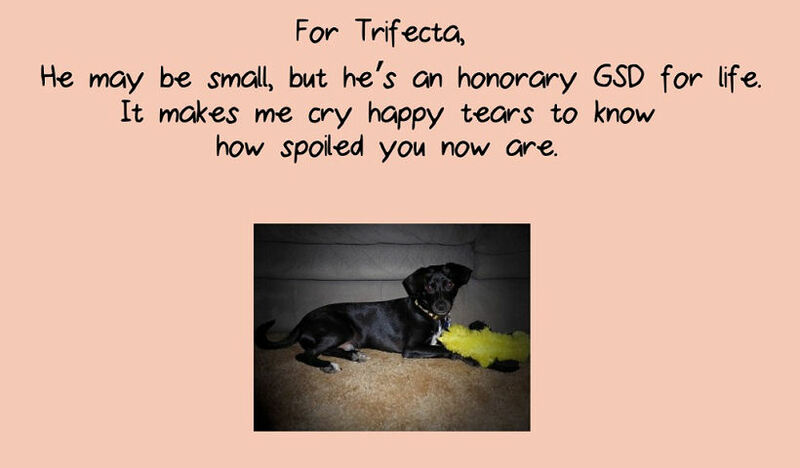 However, I’d be a big fat liar if I didn’t say that my favorite part is the fact that my dog got a dedication! 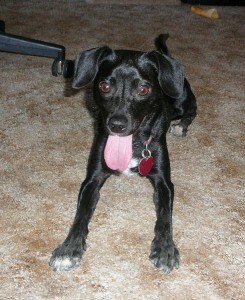 I rescued my pup a year ago from a negligent neighbor who just let him loose one day expecting the coyotes to get him. I kid you not, after I chased the dog through the desert, caught him and found out where he belonged, the woman told me that she didn’t want him and didn’t care if he became “coyote food”. Never owning a dog before it was a bumpy first few months of figuring out all the rules and tricks of owning a dog, like making sure you give the dog plenty of toys to chew on and to always have a secure lid on your bathroom trash receptacle. I was actually talking to the author on Twitter when I saw him run by my house at sunset and bailed on her in the middle of our conversation. Which is how she knew about Trifecta’s journey to becoming a book sniffer in training. 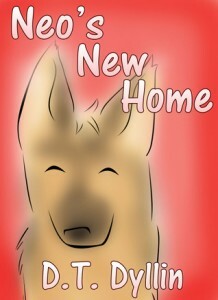 If you’d like to win a signed copy of Neo’s New Home, it’ll be up for grabs soon in the Thankful For Our Furbabies Giveaway Hop (button on sidebar). I was posting my reviews fo D.T. Dyllins Stone Gates series this morning on Goodreads and spotted this one. I’m a huge dog lover. Quigley, my pitbull/hound mix is a rescue dog and I’ve always adopted dogs from shelters. They all need someone to love them and give them a family. Years ago I had a shepherd/wolf mix named Sox because of his 4 white tipped feet. Such a beautiful animal. And I also had a collie/coyote mix. named Kataya. As soon as my next book fund kicks in I’ll be snatching this one up! Give Quigley cuddles for me. I’m a huge animal person. Which is why I’m so happy that the author is donating all the proceeds to dogs in need.